Old-fashioned doom with a heavy metal flavor rarely misses the mark. Think of some of the early heavy metal bands with doom elements -- Crystal Logic-era Manilla Road and Cirith Ungol come to mind. Hailing from Italy, the land that brought us Paul Chain and Black Hole, Kröwnn's new album, Magmafröst, doesn't disappoint either. It sounds like a cross between one of those old bands and a modern modern one in the vein of Red Fang or Orange Goblin, and the album oozes with crushing riffs. The production is a bit strange, putting the instruments overwhelmingly in the front of the mix and the sharp-toned roar of Michele el Lello Carnielli somewhat on the side. There's somewhat of a stoner element in some of the riffing on Skeksis Dance and Wyvernking, occasionally languid and relaxed in the manner of a sleepy elephant getting ready to step on the listener, and then the music gets more focused, squealing with feedback at some points, chugging with an unstoppable heaviness with Carnielli's thin howl echoing in the background. To Minas Morgul is more subtle, with the drumming and bassline far more visible than in other tracks. The dark, mysterious flavor of the whispering alongside the riffs is an interesting sound, and the chugging final few minutes are simply wonderful to hear; maybe it's just because I had this one turned way up while I was listening, but I think that's the correct volume to hear it at. The blocky riffs of Forge of Crom, with the guitar subsonically clashing with screeching feedback, are also great to hear; Carnielli is practically mumbling his way through the verses on this one, but after listening to the instruments doing the talking, the vocal part is just icing on the cake, especially when followed by a five-minute instrumental outro. 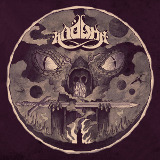 This is definitely one to get if your thing is thunderously crushing doom metal with fantasy references. I saw some reviewers calling this retro, but really, the stoner flavor of feedback-laden heavy guitar is pretty modern. Either way, it's pretty likely that doom fans will like this one.